Ingredients: (Makes 32 pieces, about 65 calories each). 1. Line one 20×10 cm (8×4 inch) loaf tin (pan) with baking parchment. 2. Place all of the ingredients into a microwave-safe bowl. 3. 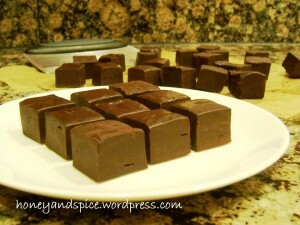 Pop into the microwave and “cook” for 2-3 minutes, then stir until the mixture is smooth and creamy, like ganache. 4. Pour into the prepared loaf tin (pan) and smooth out using the back of a wet metal spoon. 5. Chill until set, about 2-3 hours. 6. Cut into 32 squares and enjoy! NOTE: If you want to use the whole tin (can) of condensed milk, simply double the recipe and pour the fudge into one 20×20 cm (8×8 inch) square tin (pan). Recipe & Image submitted by Linda Lai (click on her name to read her blog).